Folks, what you see here is not your average baked potato. Let me introduce The M.O.A.B. -- The Mother Of All Bakers. You see, that plate in the picture is 10 1/2 inches in diameter. 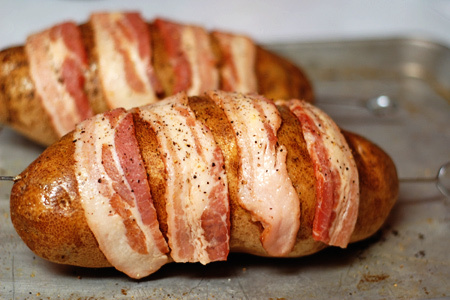 We're talking about just under three pounds of loaded bacon-laden baker bliss. I'm not normally one to jump on the over-the-top food bandwagon. This happened because of friendly visit from one of our neighbors. My wife IM'd me at work the other day and said that our neighbor, Tabatha, stopped by and gave us a bag of potatoes and onions. Of course, I thought that was a very kind of her. What I didn't know is that said potatoes were apparently grown in some field near a nuclear reactor. 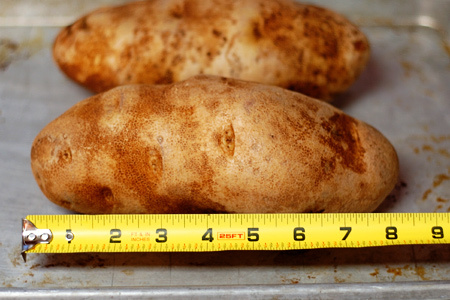 Of course Idaho is known for our famous potatoes (it's even printed on our license plates), but these things are huge! I've lived here for 15 years and I have never seen potatoes even close to this large. I met the late billionaire potato magnate J.R. Simplot once and he offered to show me "a potato as big as a football". I thought it was an outlandish claim at the time, but I am a believer now. After looking them over and chuckling under my breath in amazement, I set them aside. Then, on the way home from work tonight I had a moment of tuber clarity. I decided that these were destined to be baked and enjoyed as any fine Idaho Russet should. Once I decided to bake them, I quickly realized that I had a problem. How in the world do you bake such a huge potato so that the inside gets done before the outside turns into a dry crusty mess? Then it hit me. My mother used to stick these thick aluminum skewers through her potatoes when she baked them. I never really understood it until later in life. See, the idea is that the metal conducts heat into the center of the potato and thereby speeds the cooking. Well, it just so happens that I have some metal shish kabob skewers that would work nicely. To me the skin is the best part of a properly baked potato. I like to oil the skin so that they get nice and almost crunchy. A baker should never see the inside of a piece of foil! I also like bacon on my baker, but I didn't really want to deal with cooking the bacon. Eureka! I'll cook the bacon on the potatoes! This, I must admit, was a serious moment of kitchen resourcefulness for me. 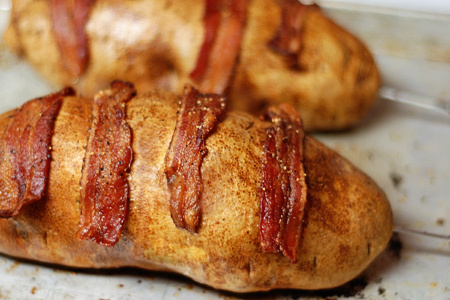 What could be better than bacon-coated baker skin? Each was skewered and draped with four half-slices of bacon. I then hit them with a liberal dose of fresh-ground black pepper. I baked them at 375º for 30 minutes, then I turned the heat down to 350º, cooked them for another 45 minutes. By this time the bacon was nicely done, so I removed it. The potatoes were not even close to being done, so I rolled them around in the bacon fat and returned them to the oven. Forty five minutes later they were done. That's two hours of total cooking time. And there, ladies and gentlemen, you have The M.O.A.B. -- The Mother Of All Bakers. Sadly, I could only eat half of it, but I have lunch for tomorrow. My idea of heaven, right there. I'm a relatively new reader to your site, and you never fail to make me glad I stopped in! WOW! This looks devine and could probablly feed a crowd! DELISH! That looks incredible, I could so do with that right now. Those are rather amazing looking! Your tip about the metal through the core reminded me of the funniest cooking gadget we ever got, the "perfect potato". I think it was by the Fry Daddy people. It was like a mini Foreman grill that held just two potatoes. But you pierced each with an X shaped skewer. So while a gimmicky product, it does embrace the concept you mention. I'll have to keep this in mind, great tip, John. Wow. Those taters sure are huge! (There's my lame attempt to sound stereotypically Texan) They look great! My mom had aluminum potato skewers, and I used to have them too, but ditched them in favor of a metal kabob skewer. My sister lives in Idaho. She brought everyone some potatoes a few years back, on a visit home. They were like yours, freakishly huge. But also some of the best taters we have ever had. One tater would make a meal for me and my guy! Now I am hungry for a bacon thatched potato; that was a great idea! John, you might want to check yourself in a week or so and make sure you are not glowing green after eating M.O.A.N.B. The Mother Of All Nuclear Bakers;-) It does look great. The skewer tip is such a great idea, my potato are always still raw on the inside when the outside is perfect. Thanks for posting, these look great! That is one beautiful potato!!! My mother used those skewer things and I had totally forgotten about them!!! 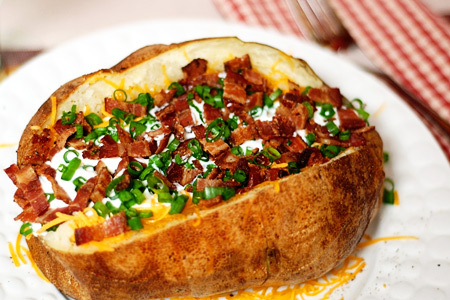 Nothing better than a loaded potato in my book! I love the look of your site and your food. Thanks. These look so good!! I love potatoes, you can do so much with them. The bacon on the outside is a great idea!